Bob Kurland played 6 seasons. Last active season was 1952. Charlie Bowerman played 3 seasons. Last active season was 1964. This is a great time of the year for the sports fan! We have a little bit of football left (we never get tired of football). The PGA Tour has started its season (I wonder how Tiger will play?). Oklahoma and Oklahoma State, men and women, have just started conference play (here’s hoping our state teams get to the Big Dance). The NBA season is about half over (Thunder Up!). The state of Oklahoma has a rich tradition in basketball. One of the best amateur teams to ever play the game was the Phillips 66ers out of Bartlesville, Oklahoma. In 1919, Bartlesville’s local boys were returning from World War I. Some of the guys found jobs at Phillips Petroleum, and began playing basketball as a form of recreation. When it was suggested to executive Frank Phillips that a basketball team be formed under the company name, he thought it was a good idea. Beginning in 1920, the 66ers grew in popularity right along with the company’s gasoline. The 66ers grew from a “small town team” to an organization of accomplished amateur athletes receiving national and world-wide attention. 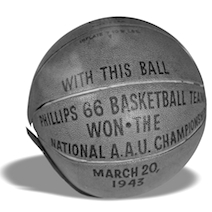 In 1922, the Phillips team made its first appearance in the AAU national tournament. The 66ers did not return to the national tournament until 1929. That was the year Louis Wilke became the teams first full-time coach and two years after Phillips opened its first service station. The 66ers won their first national AAU title in 1940. The 66ers were so dominant in their day, five of the players, and their coach, were part of the 1948 Olympic team that won the gold medal in London. In all, 12 Phillips players and two coaches have represented the United States in Olympic competition. The 66rs were a very good basketball team for 48 years: They won 1,543 games, lost only 271. That’s an 85% winning percentage. Phillips captured 11 AAU titles, including six in a row from 1943 to 1948. They won 11 championships in 14 years in the National Industrial Basketball League. At one point, from January 1950 through February 1951, the 66ers won 57 straight games. The 66ers played 70 or 80 games a year. Their record becomes even more impressive when you consider most of their games were played on the road. Games were scheduled in cities where Phillips wanted to do business. The basketball team was an excellent marketing tool. Scheduling conflicts with college teams and the rise of professional basketball forced the team to disband after the 1968 season. But even today, nearly half a century later, the Phillips 66ers are considered by many to be the greatest amateur basketball team of all time. In October 2010, the Bartlesville Sports Commission inducted the Phillips 66ers into the Bartlesville Sports Hall of Fame. Robbie Robertson is an award winning television and radio sportscaster who has been in the Oklahoma City market for almost 40 years. Robbie is currently the television and radio spokesperson for the Bob Howard Automall. Robbie, and his wife Adrienne, do volunteer work for the Episcopal Diocese of Oklahoma and are active members of St. John’s Episcopal church.